The retro computer hobbyist group MARCH hosted the Vintage Computer Festival East 2011 exhibit. 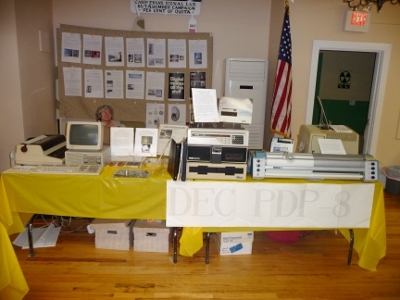 I brought a PDP-8/A with DSD-440 8 inch floppy drives and Calcomp 563 incremental plotter. DECmate III, and Letterprinter 100/LA100 printer for my exhibit. The PDP-8/A was the last Omnibus PDP-8. The DECmate III was the next to last of the PDP-8 line of computers. The PDP-8/A was running OS/8 and I was mainly running various plots on the Calcomp. I also has various games people could play. The DECmate III was running OS/8 and I had it printing out an ASCII art cat. All the computers behaved fine this time.